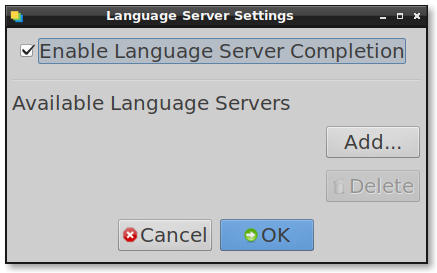 With the coming release of CodeLite 13, the plugin Language Server (LSP) allows the user to integrate a language server and use it for providing code-completion, go to definition etc. Priority Multiple LSPs can be configured to handle the same language. Moreover, CodeLite provides an internal completion providers for C++/PHP and Nodejs. Setting the priority determines which provider will be called first in the chain. If you are using CodeLite's default build system, CodeLite will generate this file automatically for you each time you trigger a build.